Following on from Part 1, when the problem first manifested. Alas my difficulties in getting home the previous evening were nothing compared to the following day… The Sprint behaved beautifully after a full overnight charge, but on my 100 mile commute the battery dwindled almost completely – first hint of trouble when the tachometer and speedo both fluttered & died, second hint of trouble when the bike followed suit. I should, of course, have performed a little testing the previous evening instead of confidently assuming that the problem was the loose battery cable. Had I done so I would probably have noticed that she wasn’t charging at all. 1. The Sprint uses a Shunt Regulator/Rectifier – not very efficient and tend to run very hot – I know there has been a spate of these failing (maybe down to the recent hot weather), seriously – if you still have the original shunt type Regulator/Rectifier then I’d consider changing it to a MOSFET one before it goes and takes your alternator stator with it. 2. The nice, thick, high current DC cables out from the Regulator/Rectifier disappear into the wiring loom, becoming much thinner (hence hotter and inefficient under load). 3. Alternator Stator insulation not quite as good as it should be. Result of all this is that my sudden stint of high mileage commuting burned out the shunt Regulator/Rectifier, which shorted. The duff Reg/Rec then pulled too much current from the 3-phase alternator. 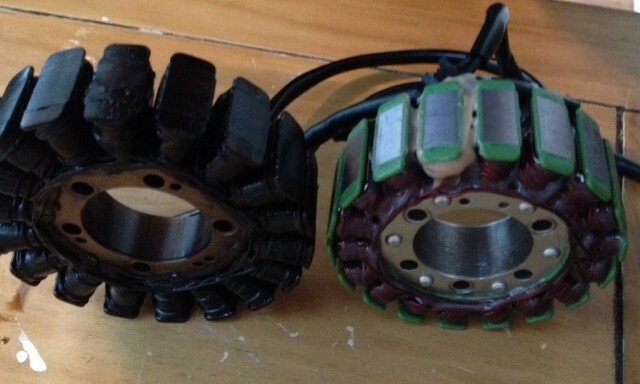 The Alternator Stator got so hot it burnt out its insulation and shorted the coils to ground (pic to right). Pay Triumph nearly £600 for replacement alternator stator and shunt Reg/Reg, plus about £300 for fitting – which would get me back to a fully functional, but potentially still temperamental charging system..? Purchase of higher quality Electrosport ESG959 Alternator Stator and Electrosport ESR535 MOSFET Regulator/Rectifier – from M&P in the UK, less than £170 for both items. Not quite as simple as it sounds – took me best part of a day in all, with much grunting and cursing. Still, <£200 versus >£900 for a less efficient system – the work was worthwhile. Not to mention the warm glow of satisfaction from a job well done. Putting out 14.4 volts at the battery from tick-over right across the rev range; at every start the motor spins like she’s being jump-started by a truck. The ESR535 MOSFET Reg/Rec runs cool enough to touch (just try that with a shunt Reg/Rec). After carefully checking dimensions I ordered the ESG959, although this was described as a 2010 Triumph Tiger 1050 Alternator Stator (115mm x 42mm x 22mm) – The moral being check measurements before you buy, don’t rely on the description (cost me an additional 3 days no riding). Here you can see the direct feed from the Reg/Rec back to battery – ran 30 Amp cable (fused) from the output ~10 inches to battery positive and ground. Much more efficient rock-solid regulation and charging now as no losses from passing heavy current through the loom as before – the good stuff has an easy path right to where it does most good. Don’t forget – as I did – you’ll need a gasket for the alternator casing. Fortunately the excellent Philip Youles Blackburn Triumph Dealership is only a 20 minute blast from Westhoughton and Wooly sorted me out in short order. The problem with Youles is you go in to spend £10 and leave wanting to spend £10,000. As an aside, whilst at Youles I met and fell in love with what will be my next bike – the rather magnificent, moody yet comfortable looking Triumph Thunderbird..! zam70 on TriumphRat.net for his insight into charging loads through the loom and remediation – splicing into Reg/Rec output and running direct to battery posts. I have noticed much crisper response from my Sprint following the mod, and no dimming of the headlight at tick-over. 115 is the total diameter, 42 is the central hole diameter & 22 is the stator depth. The original gasket should be fibre, suggesting as you suspect that yours has been changed at some point. The 6.5 mm gap you refer to is way too high – on mine the gap is so small that the original stator was polished by the magnets and the replacement had no measurable gap. Finally, yep – 70 volts AC out from each coil. Many thanks for the info. I’ll be ordering the esg959 from m&p tomorrow. Was out on a run with my local IAM group today when my beloved Sprint ST955i slowly died – with symptoms very much as in your article. Would you kindly tell me what year yours is? Mine is 2004 and thus has the wider engine and NO oil level sight glass. I’m thinking the alternators on these later (dip stick) models may be different to those on earlier Sprints. Hi Peter – Mine’s a 2004 model with no sight glass too 😉 Guess that’s why my first alternator didn’t fit (despite correct year and model in description). If coils also gone I’d heartily recommend the ESG replacements – Electrosport ESG959 Alternator Stator and Electrosport ESR535 MOSFET Regulator/Rectifier – both still working a treat on my Sprint..! I’m also aware of at least 2 riders who’ve fitted these (without the splice direct to battery tip referred to in the article) where they are still showing 14v at the battery and experiencing no further issues. Nothing like advice born from experience! Yet another one! – Mine just did the same on day one of a European tour. Gutted is not the word. It’s stuck in a french garage at the moment but when I get it back I’ll definitely be fitted both the stator and the rec you recommended. Day 1..! Now that’s what I call a downer… Hope it’s not spoiled the trip too much..? Took mine round France (post-fix) and she didn’t miss a beat. Hoping to do something similar on the Thunderbird soon. Thanks for this great write-up. I’m having what sounds like the same problem on my 02 model Sprint ST 955i (dipstick). You start off with a fully charged battery, within 60 miles battery’s so gubbed the bike doesn’t start 🙁 …. If you’re alternator’s OK then sure, just change the reg/rec for the ESR535. When it’s running you should be getting about 70 volts per phase out of the alternator… if so then no worries. You’re a lucky man if you just blown the Reg/Rec..! As in ‘it could have been worse’. Thanks for any help. I appreciate if it’s too complicated to explain. Or do I just take the connector I’m talking about and measure the voltages at idle and 5000rpm between the 3 pins…? simple as that? Hi, tiger 2004, I’ve seam to have a problem with my all my lights flickers, worse at 5000rpm. Charging the battery is not a problem, found this out at Calais after leaving Sat nav on (wired direct to battery but forgot to remove) after bumping of and 100 miles bikes stared up fine but it’s this light flicker that’s my problem, dash lights too. Any ideas please. Well if recharging after a run, safe to say it’s not the charging problem discussed here. If the problem is just headlights and clocks I would suspect a loose connection on the feed or earth for this area. Revving at 5,000 probably vibrates the connection looser than it is at tick-over. Manual investigation of cables/connectors in this are is where I’d start… good luck..! Not sure if I was supposed to do this but I disconnected the connector block with the 3 yellow wire from regulator, ran the bike at standstill for a very short period, no flicker, switched of, reconnected, flicker was back. Thanks for reply and any further help. Sat by a pool in Malta and drinking beer so please excuse any rambling..! No problem with disconnecting alternator (3 yellow wires) – you can do this to check output voltage. If your lights do not flicker with alternator disconnected, but do when it is connected, then I’d suspect your regulator/rectifier (referred to in the article). I’m guessing that all lights/electrics flicker..? I’d change it now to be on the safe side – if it goes short it will burn out the alternator too. If it were any other electrical issue it would manifest regardless of the alternator connection state. Why that sounds fantastic sat by the pool with beer. I got back yesterday from San Marino and a week in the Alps on said motorcycle. Yes I best change that R/R. What with your help and my findings on internet it’s looking very likely. Unfortunately this post is 5 years and two bikes ago – honestly don’t remember the exact details. I do know people who didn’t take it that far and had great success just changing the hardware so would not worry if you don’t fancy tackling that part. As I recall – ring connector on high current cable for battery post connection, to an in-line 30 Amp fuse, spliced into the original DC feed near the connector. Additional precaution of cable management sheath to protect from damage – only about a 10” run. This was why I included the important note to confirm measurements and not go off the supposed part number – same thing cost me 3 days. Would love to take the Rocket abroad…!